The Third Protector of Queen Elizabeth II is Here! When you're about to be crowned as the Queen of England at the age of 27, it helps to have a bit of protection! That's why the British Ministry of Works commissioned sculptor James Woodford RA to create a series of 10 heraldic beasts, each symbolizing a different chapter of the Queen's genealogy, for Her Majesty's coronation ceremony on June 2, 1953. First sculpted in plaster, the Queen's Beasts have had several homes since their debut, now residing in the Canadian Museum of History in Quebec. However, James Woodford RA also sculpted replicas of the beasts in Portland stone that now sit outside the Kew Gardens in London. Introducing the Fierce Red Dragon of Wales! Now, the Royal Mint is introducing the third design in the popular Queen's Beasts bullion coin series -- the Red Dragon of Wales! 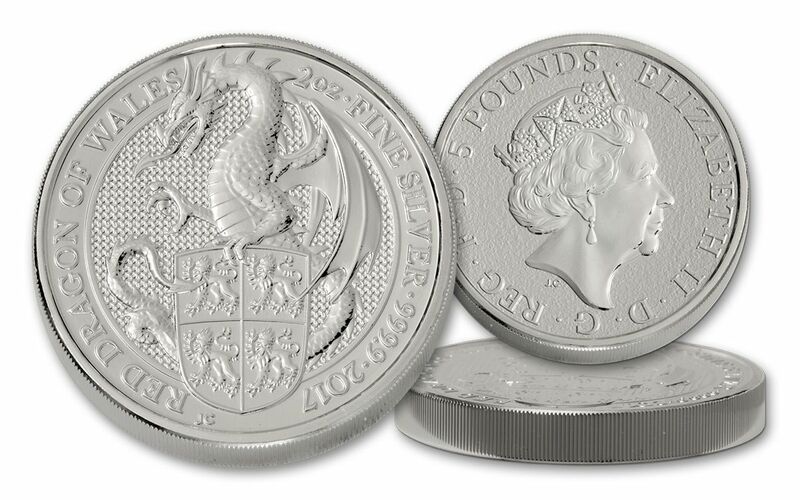 Following the popular Lion of England and Griffin of Edward III releases, this newest Queen's Beasts coin brilliantly depicts the symbolic Welsh Dragon, hallmark of sovereignty and power for centuries. A figure of Welsh history since the sixth century and a feature of the Royal Coat of Arms since the sixteenth century, the Red Dragon of Wales has been reimagined for the twenty-first century by acclaimed designer Jody Clark. 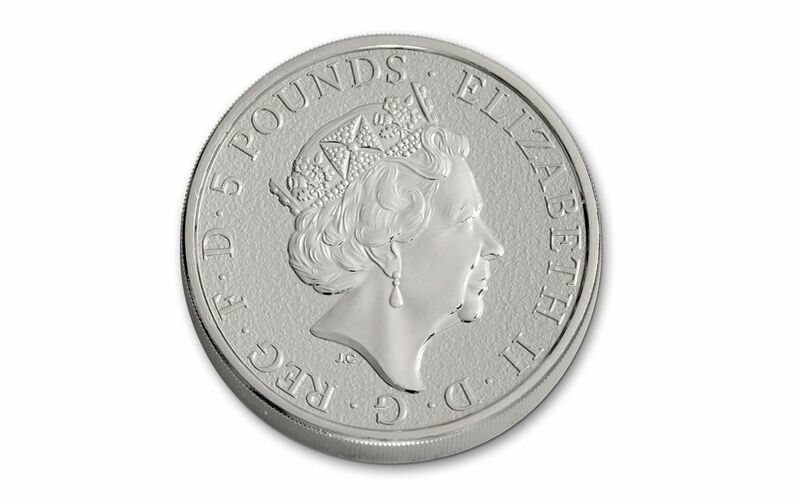 In addition, Clark designed the coin's obverse -- the latest definitive coinage portrait of Queen Elizabeth II, used on all coins from the UK since 2015. 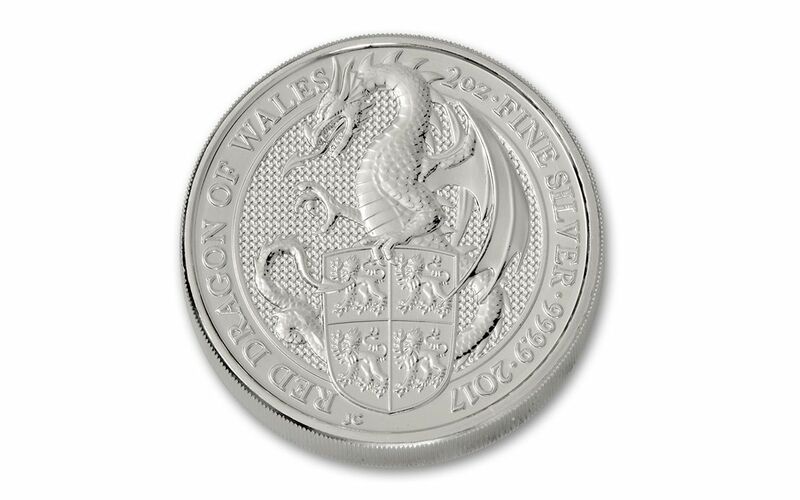 Your 2017 Queen's Beast Welsh Dragon comes minted in two ounces of 99.99% pure silver and is legal tender five Pounds Sterling. 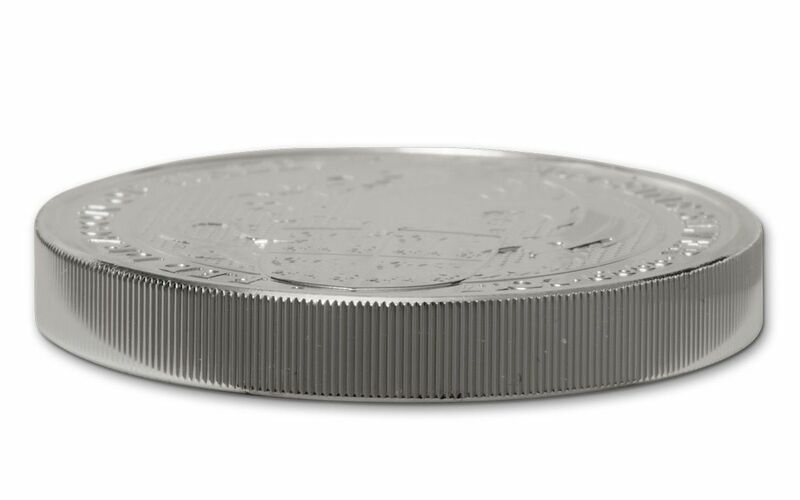 This silver bullion coin will arrive to you in Brilliant Uncirculated (BU) condition, ready to add to your collection. With the Queen's recent birthday and accomplishment of being the longest reigning monarch in British history, we expect these tremendously collectible installments of the series to be acquired quickly! Don't miss out on your chance to continue the series, start a new collection or just get a great piece of numismatic art -- buy yours today!